The expression “delete bad copies” sounds like relatively benign office work, until you start encountering your own personal doppelgangers. Much to his surprise, Hitoshi Nagano gets along rather well with his first other “me.” He is okay with the next one too. 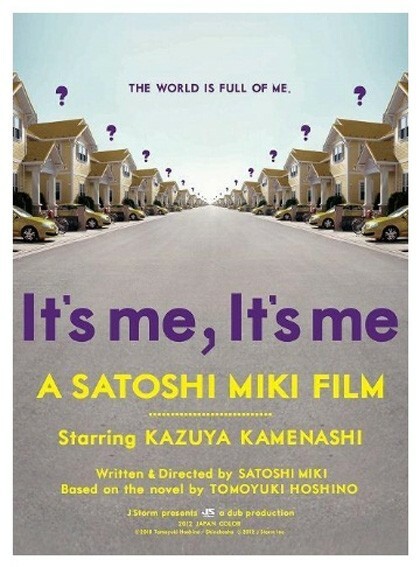 Then things start getting complicated in Satoshi Miki’s It’s Me, It’s Me (trailer here), which screens tonight as a co-presentation of the 2013 Japan Cuts and this year’s New York Asian Film Festival. Nagano does not have a lot going on in his life. Having thrown in the towel on his photography ambitions, he limps through each day as a clerk in a big box appliance store. One fateful day at a fast food restaurant, a loud mouth young wheeler-dealer named Daiki inadvertently leaves his smart phone on Nagano’s tray. Acting on a perverse impulse, he uses the phone to con Daiki’s mother into depositing a few hundred thousand yen into his account. Feeling remorseful, Nagano tries to return the money. However, Daiki’s mother will not take it back. She also seems to think he is her son, Daiki. As it happens, they could indeed be twins. Yet, when Nagano visits his own mother, she does not recognize him. Instead, she insists Daiki the Doppelganger is actually Hitoshi Nagano. Later, the man who admits he kind of, sort of is Daiki explains to Nagano his mother was particularly upset because a third doppelganger had been coming round, making scenes. That would be Nao, the hipster student. When the three get together, they are like three peas in a pod—different but the same. They start calling their bolt-hole “Me Island” and cover for Nagano when he needs to bail on work. As if meeting his second selves were not eventful enough, he also starts cautiously pursuing Sayaka, an attractive older customer, who is married to a gangster. The mood darkens drastically though when Nao starts bringing round even more doppelgangers. Based on the novel by Hoshino Tomoyuki, IMIM is one of the most original takes on the doppelganger archetype since Capt. Kirk battled his evil twin in the late Richard Matheson’s “The Enemy Within.” Part urban fantasy, part dark thriller, and part surreal head-trip, it is devilishly difficult to classify. In a way, IMIM has a vibe similar to Sion Sono’s Love Exposure, in which strange and bizarre circumstances take on nationwide significance that everyone accepts with matter-of-fact nonchalance. Indeed, the straight-faced media reports on the mushrooming “copy deletion” phenomenon serve as a sly social commentary, but they are deadly serious for the original Nagano. J-pop star Kazuya Kamenashi nicely steps into the postmodern Alec Guinness role of Nagano et al, creating intriguingly distinct personas for each “me.” Yuki Uchida adds some grace and sophistication as Sayaka, while Ryo Kase is all kinds of creepy clamminess as Nagano’s abusive store manager, Tajima. It’s Me, It’s Me is a very clever film that patiently establishes its character(s) and premise. As a result, the payoff is subtle but satisfying. A smart genre hybrid, It’s Me, It’s Me is recommended quite highly when it screens tonight (7/13) at the Japan Society, as a joint presentation of this year’s Japan Cuts and New York Asian Film Festival.